I recently wrote a review of the cashback site Ebates. It’s one of my favorite cashback sites along with Shop Discover and Mr. Rebates. I use all three of these sites at various times, depending on which one has the highest cashback rate for a given merchant. Today I’m writing about a cool giveaway from Ebates. 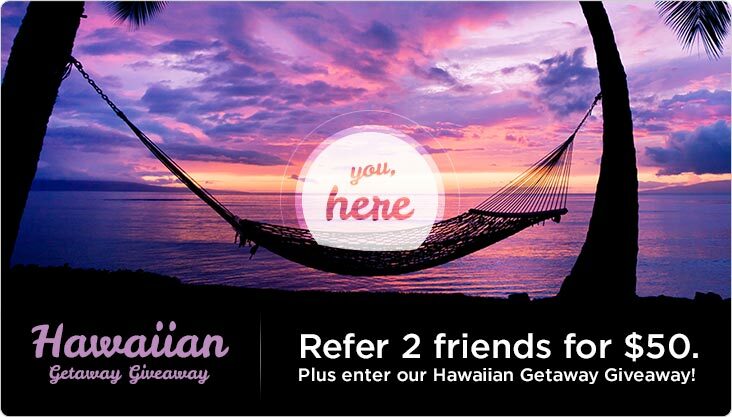 If you refer at least two friends and they make a purchase using the site of at least $25, you will receive $50 and be entered for a chance to win a Hawaiian vacation. This latter part sounds amazing to me as I’ve been sweltering in the Texas Summer for a couple months now. You can read the full terms here. It is worth noting that Ebates is having their double cashback promo period for back to school. My main point in writing this article is hoping that you might signup through my link and increase my odds of winning the Hawaiian vacation. I assure you I need it and would enjoy it thoroughly. I even sunk to a new low by soliciting my co-workers to signup with my referral link. Here is what I wrote to them. Will one of you use my link to signup for Ebates and make a purchase of at least $25? Ebates is currently having a double cashback period for back to school. You can earn twice the cashback from sites like Target and Best Buy.